The maximum growth rates of P. aeruginosa PA14 wild type and ∆pelA cells in mixed liquid culture. n = 4 biological x 6 technical replicates (different overnight cultures and microtiter plate wells, respectively (bars denote means ± S.E.). Growth rates were measured as the maximum slope of growth curves of cultures whose optical density at 600 nm was taken every 30 min until stationary phase. Cultures were grown in minimal M9 medium with 0.5% glucose at ambient room temperature (24°C). 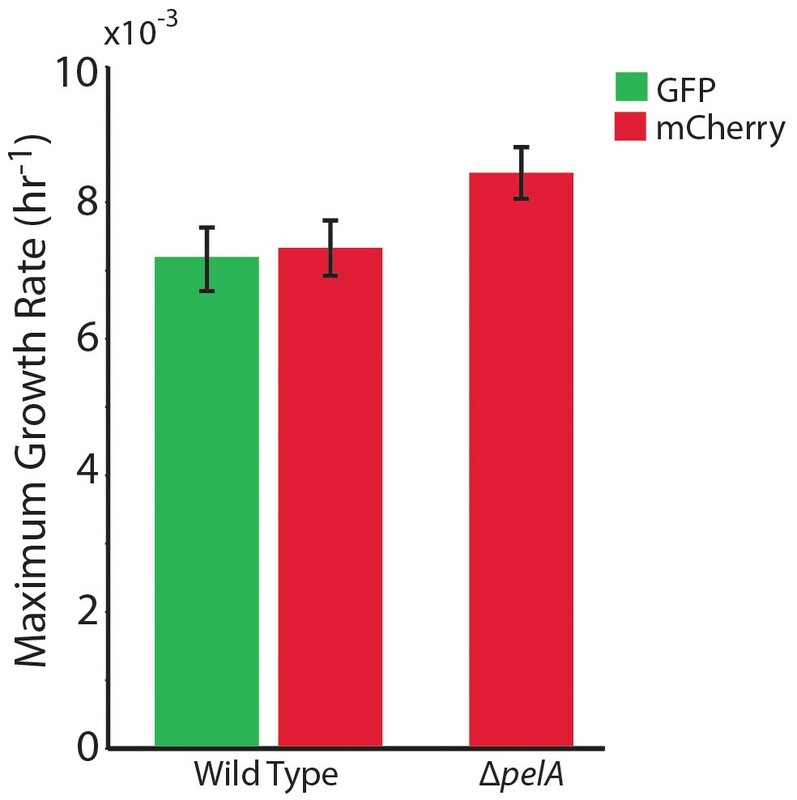 The maximum growth rates of wild-type cells expressing GFP and wild-type cells expressing mCherry were not different, indicating that the fluorescent protein constructs did not introduce growth rate bias (two-sample t = 0.235, df = 6, p=0.822). A two-sample t-test comparing the maximum growth rate of the ∆pelA strain against the pooled data for wild type (t = 2.31, df = 10, p=0.0432) suggests a growth rate decrement on the part of wild type relative to ∆pelA, but was not statistically significant at a critical p<0.05 threshold with Bonferroni correction for two pairwise comparisons. Maximum liquid culture growth rates of study strains. Biofilm production of WT and Pel-deficient P. aeruginosa in mono-culture and co-culture; cell counts in chamber effluents. (A) WT and ΔpelA biomass accumulation. (C) WT and ΔpelA cell counts in effluent. Occurrence of WT and Pel-deficient P. aeruginosa in areas with flow blocked versus areas with flow open. Biomass accumulation of WT and Pel-deficient P. aeruginosa under different degrees of shear stress. Streamer structures produced by wild-type P. aeruginosa PA14 (green) in microfluidic chambers with complex flow profiles do not capture large numbers of co-cultured ∆pelA mutants (red) over 72 hr of biofilm growth (black circles are column obstacles). Analysis procedure for correlating local flow and accumulation of ∆pelA and wild-type cells. Liquid enters the chamber on the left and exits on the right. 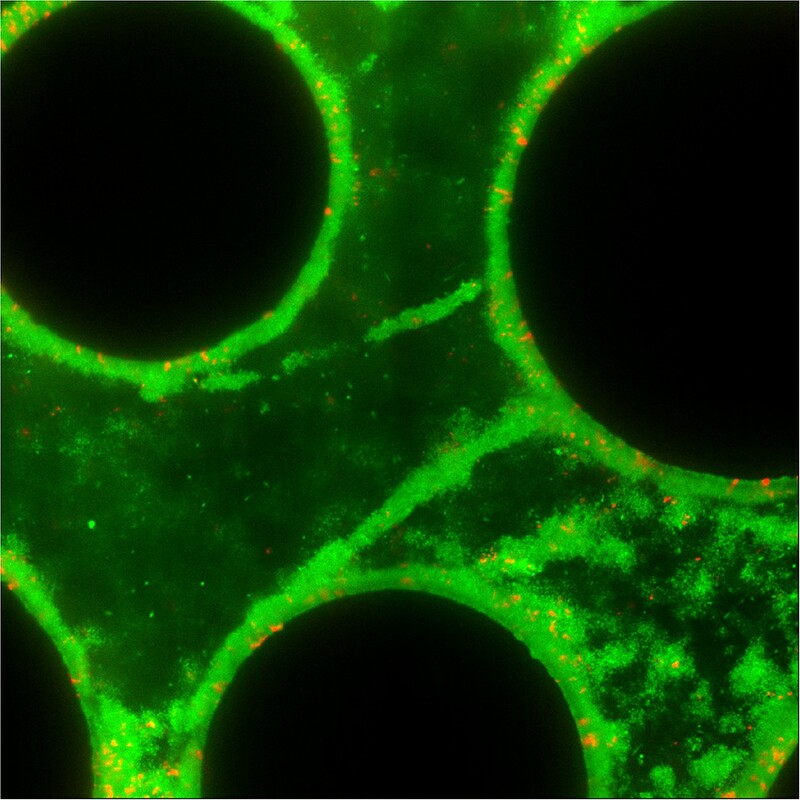 (A) First, the positions of the columns were identified from the fluorescence image. The centers of the columns served as nodes to divide the spaces into triangular regions. Within each region, the area covered by the column was removed. (B) The corresponding image with fluorescent beads (white) to track local flows. Typically, 10 to 15 images were taken and integrated to cover the flow regions sampled by the beads. Overlaid are triangular regions showing ∆pelA cell accumulation (from (C)). (C) Averaged intensity within each sampling region was calculated, and a threshold was set to determine if biofilm accumulation occurred in each region. 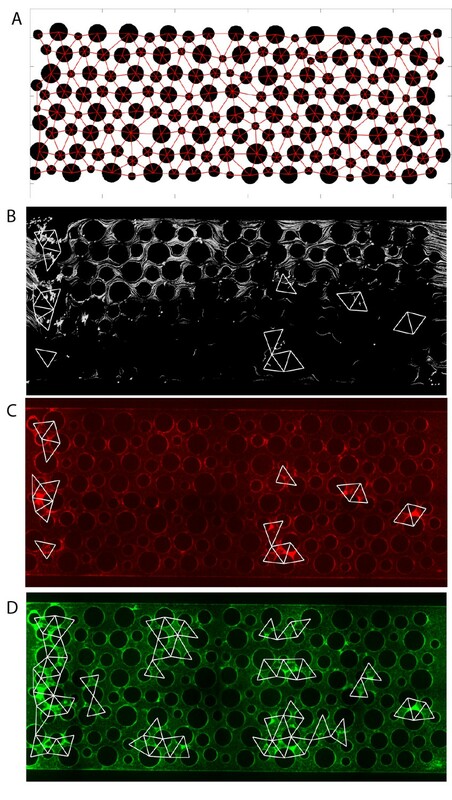 White triangles correspond to regions identified as containing biofilms using this method. ∆pelA cells accumulated primarily in regions lacking flow due to upstream clogging or in regions immediately downstream of obstructed areas. (D) Wild-type cells accumulated both in areas of high flow and areas of low flow. 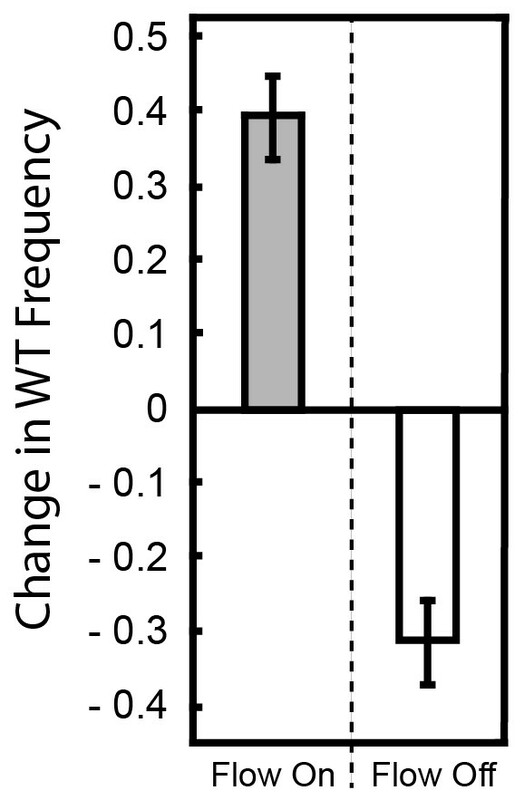 Change in frequency of WT cells from a 1:1 starting population with ∆pelA with and without flow. P. aeruginosa PA14 and the ∆pelA strain were inoculated at a 1:1 ratio and allowed to form biofilms in planar microfluidic devices with or without flow for 72 hr. At that time, the biofilms were imaged, and the change in relative frequency of the wild-type strain was calculated (as in Figure 1 in the main text). When flow was present, the WT outcompeted the ∆pelA strain, and thus, the WT strain tended to show a positive change in frequency within biofilms (gray). When flow was absent, the WT strain tended to show a negative change in frequency (white). Bars denote means ± S.D. for n = 3–4. Comparison of competition in simple chambers with or without flow.